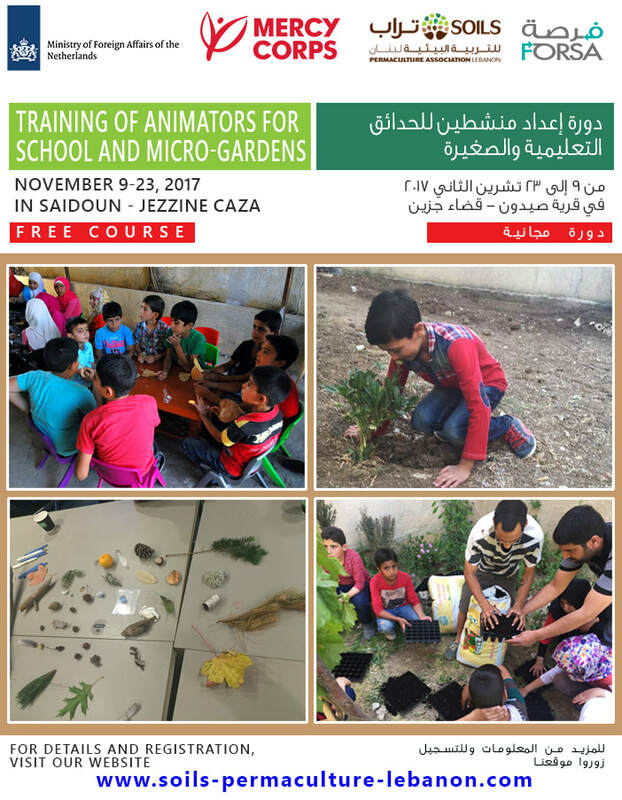 SOILS Pemaculture Association Lebanon is proud to organize the Training of Animators of School and Micro-Gardens in collaboration with Mercy Corps, within the FORSA project, with funding from the Ministry of Foreign Affairs of the Netherlands. This 2-week residential training course aims to equip young graduates with the necessary tools and knowledge to work as animators of learning gardens in different contexts (schools, refugee camps, or rooftops/balconies in urban areas). The trainees will be able to design and accompany children and adults in setting up small gardens and taking care of them, based on the principles of permaculture and agro-ecology. Morning sessions from 9:00 a.m to 1:00 p.m. Afternoon sessions from 2:00 p.m. to 6:00 p.m.
of the Saidoun public school, or in guest houses in the village. Participation in the training is free of charge. of November (date and location to be confirmed). Recent graduates in one of the following majors: Agriculture Engineering, Landscape Design, Environmental Sciences, Education. Priority will be given to the Lebanese University graduates. Age group: 21 - 28 years old. Applicants should be able to commit to the whole training period, should not have a full-time job, and should be interested in working as garden animators in the future. ​Saad is an agronomist and environmentalist specialized in agro-ecology. He has over 25 years of experience, particularly in nature restoration and water retention landscape techniques. Saad introduced agro-ecology in Palestine 15 years ago, converting the village of Farkha in the West Bank into the country’s first eco-village and is now working to bring this concept to two other villages. As a member of the Sharaka group, a Palestinian voluntary group that supports Palestinian farmers in marketing their products directly to consumers, he helped establish the first community-run eco-farm in Palestine last year. He also recently launched his own agro-ecological farm (The Humanistic Farm). Previously, Saad was the director general of the Arab Agronomist Association (a Palestinian NGO) and made agro-ecology the main goal of the association. In addition to his work in agro-ecology, Saad is a yoga teacher, an agro-ecological farmer, and a beekeeper. * Others facilitators will be leading specific sessions (names to be confirmed).